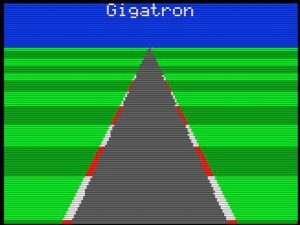 While playing Gigatron Snake at 34C3 we got asked: “how many gates are in there?”. This isn’t the first time someone has asked, so today I finally went through the TTL datasheets and counted little blocks from their logic diagrams. TL;DR: the CPU has 930 logic gates. Gate counting isn’t as straightforward as it seems though. RAM and ROM are clear: they each have thousands of logic gates in their word line decoders alone, but those aren’t part of the CPU proper. The clock isn’t part of the CPU either, but that’s just a couple of inverters. For decoding the game controller it isn’t as clear cut: the kit version has a 74HC595 shift register which has roughly 80 gates. But only 10 buffer gates are really needed by the CPU and are directly controlled by it. I fact, on the breadboard version, the input chip is just a 10-gate 74LS244 non-inverting buffer. So I count that as one 10 for the CPU. I also didn’t count the “extended output” register as part of the CPU because that is an extension on top of its primary output. I did include all other gates that are in the IC packages: An unused module is in the count (there is one unused decoder in the control unit), as well as gates that are hooked to fixed inputs (L or H), even though all of those can be optimised away in VHDL. The 4-bit adders each have 4 non-inverting buffers internally that have no logic function, but I still include them. Furthermore, I count D-type flipflops as 5 gates, and SR-types as 4. Still, the total gate count of 930 is a lot lower than I would have guessed. 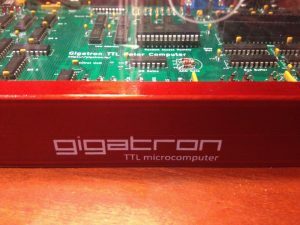 We are in the process of turning the Gigatron in a kit that can be built by others. 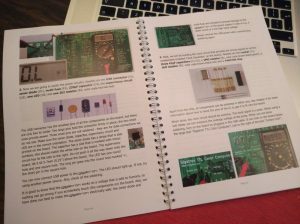 For this, I’ve made a full-colour booklet that contains a generic explanation about the electronic components used, a crash course in soldering and the actual instructions to build the Gigatron. It includes many pictures and describes how to perform tests during the building process. In the appendix, you will find the full hardware schematics. With this manual, even less experienced people should be able to build their own Gigatron. The virtual CPU or interpreter is now complete. At least, its code page is full, even overflowing a bit, and nothing can be added without removing something else. It has 25 opcodes, the last added is SYS. This is an escape: with SYS the application can jump to arbitrary native code. Here I test this capability in the “clear screen” loop, right at the beginning of the recording. Without acceleration, clearing the screen pixel by pixel with interpreted code takes more than 2 seconds. Here the application uses a SYS call that clears 8 pixels at a time. The result is that the screen now clears in 200 ms. Nice proof of concept. Restrictions apply if you don’t want to break the video timing: the callee must be timing-aware and cooperate with the interpreter loop. But it can run for longer than a regular vCPU instruction (these are 28 cycles max) and the code can do whatever it wants, as long as it completes in the available time slice on the scan line. In reality this means that SYS calls can last for up to 146 cycles. If they need more cycles, they could still use some trickery and restart themselves by messing with the virtual program counter… They are “parasitic” after all. Another novelty is that this recording is not from an actual Gigatron! Martin @ the talkchess forum has made an incredible visualisizer for the project. I didn’t get it running with the Mac binary, but it runs ok with Wine. Emulation in emulation in emulation, but it can still keep up with real time if you use “Run sketch (JIT)”. Amazing. P.S: The Christmas card is there to give my phone something to focus on. Without it the recording is blurry. The Gigatron as a kit! Some months ago my good friend Walter has silently joined the project. The reason is that I receive a lot of enthusiasm whenever I show this to friends, to the point where one is already seriously trying to write a chess program for it. So we decided to take this one step further and upgrade this to a build-it-yourself soldering kit. Today we received the first samples for the enclosure, custom designed for this computer. With a new phase comes a new name. Neither of us really liked the “Chipper” working title I used before, so the kit version will be known as the “Gigatron TTL microcomputer”. I couldn’t possibly do this alone, so I’m super happy that Walter has stepped in. 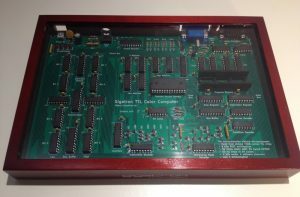 This retro-computer is something to build, play with but also look at, so we plan to offer it as complete as possible, except for the soldering you will have to do yourself. 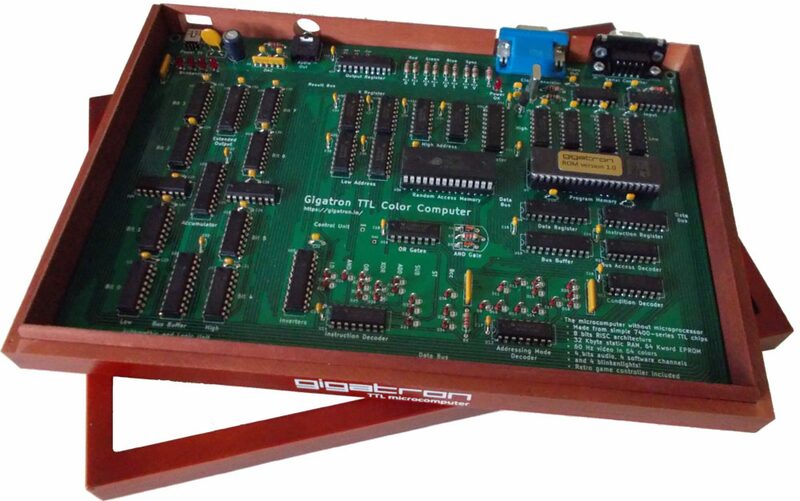 So it will include all the 74xx-TTL chips, RAM, ROM, sockets, capacitors, diodes, resistors, LEDs, supervisory circuit, jacks, a game controller, a nice mahogany coloured wooden enclosure with plexiglass viewing window, one or two built-in video games and a mini-USB cable for power. Not all details are finalised yet: the photo is a prototype and we will still change some things we don’t like. We think we can target the 150-180 euro price range (hopefully below 200 dollars), provided there is sufficient interest. For reference, getting to the first PCB version set me back north of 500 euros, that is where I stopped counting, and that excludes the oscilloscope you need when designing something like this from scratch and 800 hours of research, trial and error. This is still just a private hobby project, so this kit will be something we will literally do from our living rooms. We figure that if we do a few dozen units that would push the prices down a lot and at the same time not take too much risk. Of course a kit isn’t the same as a one-off project, and Walter has worked tirelessly on morphing the project towards something that can be reliably soldered together in 3 to 4 hours. All components are now through-hole components and sourced from proper sources (not scavenged from e-bay). Walter has written a supercool manual that includes intermediate tests, a circuit diagram and even soldering instructions and tips for novices. Although there are 144 components on the board (many capacitors and diodes), I feel it will still be a beginner’s level kit because of the spacing and all through-hole components. All you need is a soldering iron, solder, a multimeter, some pliers and a rainy Sunday afternoon. If you can make Oscar’s PiDP-8, then you can make this also. For those interested in this kit, you can subscribe to our mailing list. We will use this mailinglist only to announce when we are comfortable to accept orders, know the exact pricing and have some kits ready to ship. Subscribing to the mailing list doesn’t imply any obligation to buy: it is just a way to keep informed of when we are ready and you can easily delist as well. We expect we will be ready near the end of January. It will then also be clear what the final kit looks like, what the built-in software can do, etc. This projected started out as a Hackaday project, see https://hackaday.io/project/20781. We are moving forward and have set up this dedicated website.